In 1995, a little studio called Pixar wondered what it would be like if toys were alive. This resulted in the much loved classic, “Toy Story,” which was a joyful experience that families still enjoy to this day. In contrast, when Seth Rogan thought about what it would be like if food was alive, he realized it would be terrifying. After all, the whole point of food is to be bought and consumed by humans. 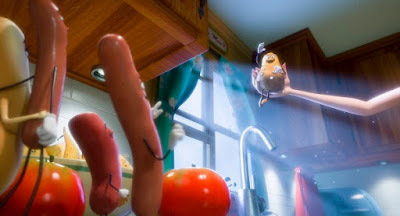 “Sausage Party” thus aims to be the anti-Pixar movie, where food comes alive, long to be taken to the great beyond, and sing an Alan Menkin song that sounds like an R-rated version of “Be Our Guest.” They also swear, make numerous sexual references, and have an obsession with “inserting” with one another. 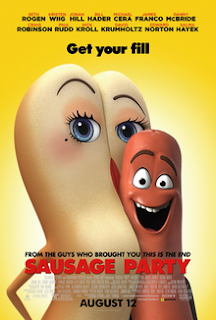 Needless to say, “Sausage Party” is highly offensive and graphic. It is also very funny at times and even oddly clever during other times. The movie, it should be said, looks like a Pixar film. At times it is even as clever as a Pixar film (rarely, I want to add, but there are moments). What the film doesn't have is Pixar's heart. In a strange twist, the movie gets very theological at one point, where big sausage Frank (Rogan) openly wonders if the stories of the gods and Great Beyond is all made up, and goes out for scientific proof to solve all of life's answers. It is a clever way to address the whole ‘God vs. Evolution' debate in a cartoon about food, but it never gets deep enough to justify how much time is spent on it. In a movie where hot dogs want to insert with buns, life's rules are made by the ‘Unperishable,' and a Latino taco shell is a lesbian played by Salma Hayek, it seems like an odd choice to get very metaphorical on the audience. Many of the audience members I was with laughed, of course, but they were laughing at the absurdity of a sausage debating the meaning the life. That does tend to be a reoccurring problem with Rogan's films, as these themes can only go so far with his brand of humor. For what it's worth though, when he is dishing out his style of humor, the movie is normally very funny, and the animation format gives him much more freedom to create gross visuals that are funny here when they would normally be too far out to stomach in a live action film. Some of you might be wondering why I single out Rogan for this movie. It is because he not only stars as the main character, but he is the films writer and producer. Normally he will even direct with his good friend Evan Goldberg, but animation is a different beast, so he wisely decided to let more experienced veterans handle that (most notably Conrad Vernon, who worked on various films for DreamWorks Animation). 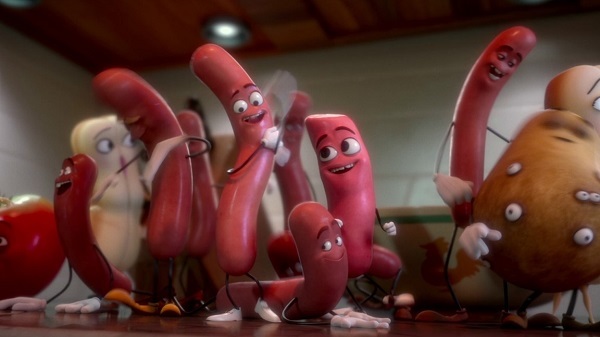 So “Sausage Party” might not exactly be cutting edge film making, but it is usually funny, and I am sort of interested to see how audiences react to it. If nothing else, hopefully this will show that adults will turn out for an R-rated animated movie. I do fear many kids will be taken to see this, who clearly should not, but it looks pretty innocent on the surface, and I fear that will cause problems. Still, this is the first major adult animated film since “South Park: Bigger, Longer, & Uncut” was released all the way back in 1999, and, as they say, you've got to start somewhere. 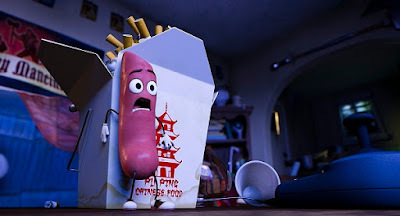 There is at least one area in my life where “Sausage Party” has had a profound effect: On the way home from the movie, I passed a Wienerschnitzel, and decided that I just couldn't get a hot dog at that time. Parents, there is strong language throughout, drug references, sexual content, violence, and a climax that is just...there are no words for it really. Recommended for ages 18 and up.